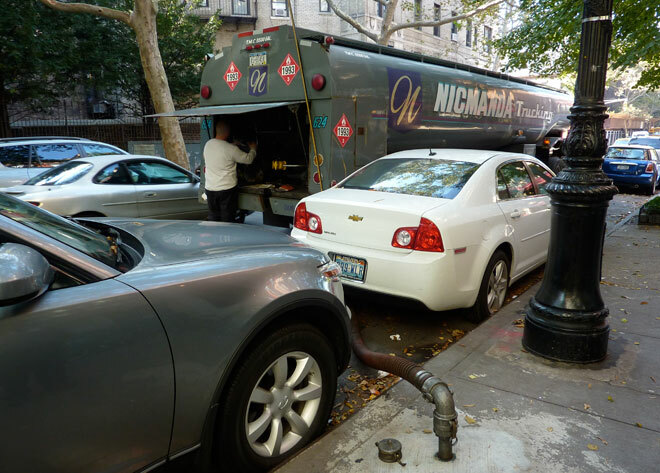 This autumn FOP gained a more intimate knowledge of the mysterious, largely unseen material that heats most of New York City throughout the winter: heating oil No. 2. This oil is considered a vast improvement over the dangerous and dirty heating oil No. 6, which was banned in New York City as of April 2011. It is also a cleaner choice compared to heating oil No. 4, a close cousin to No. 6. 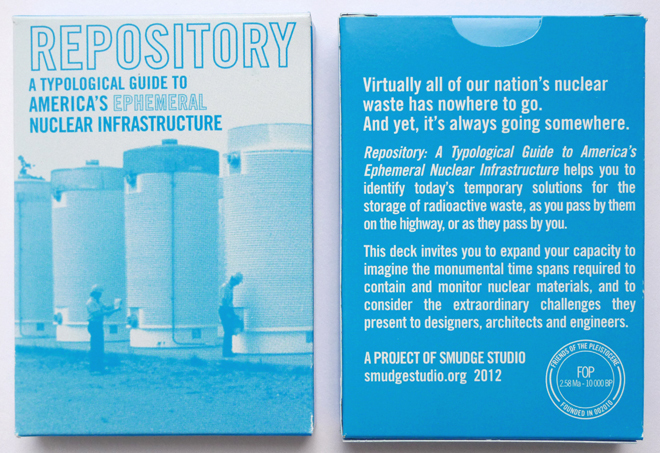 As part of our research for the Thingness of Energy project at The New School, we were given a small sample of the No. 2 oil. This was the first time we had encountered the material outside of tanks or trucks. It’s remarkably beautiful and has a low viscosity. Its color and consistency are akin to those of hibiscus tea. The striking color of this oil isn’t naturally occurring. 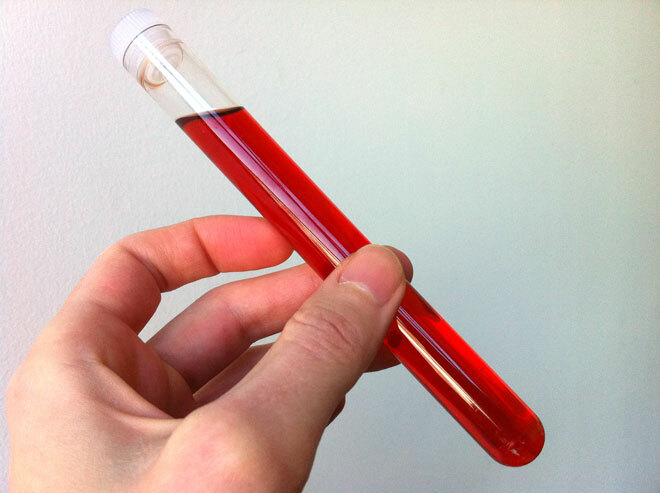 In the United States, red dye, typically Solvent Red 164, is added to distinguish No. 2 from other heating oils and automotive diesel fuel. As a result, No. 2 is also known as “red diesel.” In the United Kingdom, yellow solvent is added instead of red. We quickly learned not to be seduced by the attractive color of this substance. The oil is quite challenging to handle and emits potent noxious fumes (download material safety document for No. 2 oil). We planned to exhibit and store the material in plastic test tubes. 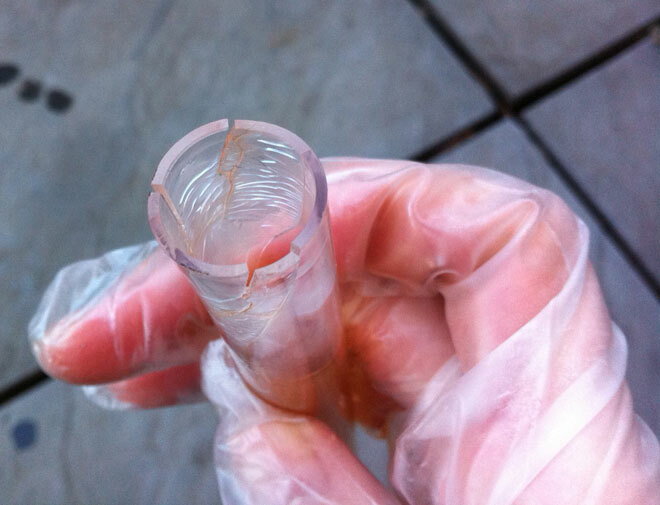 But within minutes of filling the tubes, the oil had cracked the plastic and rendered the containers unusable. We had to wear plastic gloves to work with the substance from then on, and we started looking for other containers. We ended up settling on Cryovial® tubes, designed for holding human and animal cells and to remain sealed at extreme temperatures. We are happy to report that for the past four weeks the oil has been safely contained. Though it might not look like it, heating oil No. 2 is derived from a geologic material relayed to us through time. Heating oils are distillates of crude oil, which is composed of transformed remains of animals and plants that thrived in primordial seas more than 300 million years ago. These Devonian and Carboniferous creatures have been compressed and heated by geologic forces across deep time. Today, products made out of their remains, commonly called fossil fuels, heat our homes, businesses, and universities. According to the U.S. Energy Information Administration a 42 gallon barrel of crude oil produces approximately 10 gallons of diesel, 4 gallons of jet fuel, 19 gallons of gasoline, 7 gallons of other products, 3 gallons split between heavy fuel oil and liquified petroleum gases, and less than 2 gallons of heating oil. The materiality of heating oil No. 2 requires it to be transported and delivered to customers via truck. In preparation for winter, the first deliveries were made to The New School in early November. Deliveries are sometimes made up to three times a month during the heating season, which roughly runs from November to March. Approximately 150,000 gallons of No.2 oil were needed to heat New School buildings last year, along with 50,000 gallons of No. 4 oil, for a total nearing 200,000 gallons of heating oil per season. Ironically, the trucks that deliver these heating oils run on fossil fuels too. At The New School, as with most buildings in New York, the points of entry for heating oil are located outside, often burrowed into public sidewalks. These easily overlooked plugs, like the one pictured below, outside 65 West 11th street, are vital links in the flow between delivery trucks and basements where storage tanks and boilers are housed. The two primary heating oil suppliers to The New School are Metro and Hess. These companies have operations around the world, making it pretty much impossible to trace the oil they deliver back to their specific points of origin. But on delivery days, when large hoses stretch from fuel truck to sidewalk, the connection is reestablished between The New School and the vast network of global energy flows. Once it leaves the truck, the oil is channeled into the basement and burned in boilers to generate heat that warms classrooms, offices and cafeterias throughout the University. As the material is combusted, carbon that is been locked up for millions of years is released directly into today’s atmosphere, adding to a current surplus of CO2. These emissions are geologically and literally “out of time“ in today’s world. These molecules act like an “invasive species” in the contemporary closed carbon cycle, which is otherwise capable of keeping itself in balance. Intriguing observation: classifying the release of Devonian and Carboniferous carbon today as an “invasive species”.